Getting through airport security can be one of the most frustrating aspects of traveling — especially with the TSA having the number of issues that we’ve been seeing in the news lately. Passengers have reported outlandish security checkpoint wait times, airlines (specifically American and United) have had to call in millions of dollars’ worth of reinforcements to help the TSA, and the Port Authority of New York and New Jersey even threatened to drop the agency in 2016 in favor of third-party contractors. However, airport security doesn’t have to be all doom and gloom. Here are our picks for the top 10 ways to get through airport security faster. 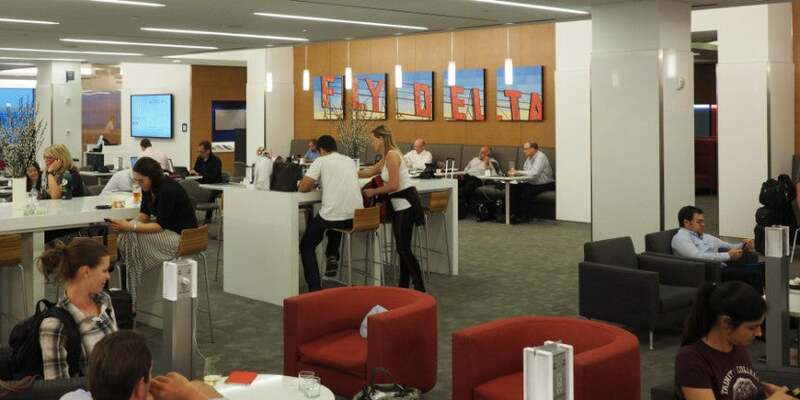 Delta Diamond Medallion members will get Sky Club membership as well as expedited security. If you don’t currently have elite status with any airline, don’t fret — gaining elite status can be quick (and easy). There are several airline co-branded credit cards that offer elite status through points-earning sign-up bonuses — see this post for complete details. Get TSA PreCheck for expedited security. TSA PreCheck (and therefore Global Entry, as Global Entry comes with PreCheck) is an incredibly useful tool to have for the frequent flyer. With it, you’ll get access to an expedited security line, as well as reduced security measures. 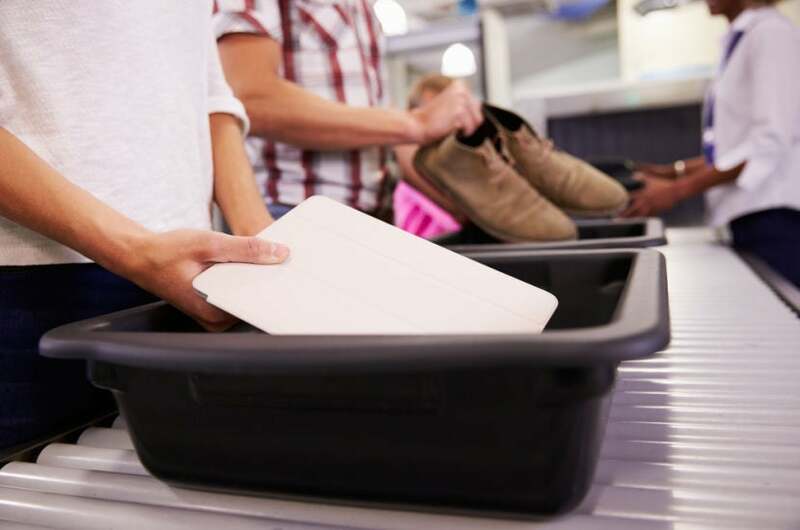 As a TSA PreCheck flyer, you don’t have to remove your shoes, belt, light jacket or your laptop and 3-1-1 liquids from your bag. PreCheck is available at more than 200 airports with 37 airlines. If you don’t have expedited security with TSA PreCheck but are considering enrolling, don’t forget that several credit cards will give you an account credit for signing up for either the PreCheck or Global Entry programs. Cards such as The Platinum Card from American Express, Citi Prestige, the Ritz-Carlton Rewards Credit Card and the Citi / AAdvantage Executive World Elite Mastercard, among others, offer credit for the cost of a Global Entry or TSA PreCheck membership. Fly in AA’s 767-300 business-class cabin for expedited security. Other than flying in a premium class giving you an enhanced in-flight experience, you’ll also be whisked away to your business or first-class seat faster just for having that ticket. Along with specific elite members with the airlines mentioned above, premium-class passengers are also entitled to expedited security lane access. CLEAR is one of the latest innovative programs created to expedite the security screening process — and it’s continuing its expansion to new airports. The service is the leading biometric identity platform in the US that utilizes fingerprint and iris scanning to speed up the identification process at airport security checkpoints. CLEAR is currently available at more than 30 airports, including Atlanta (ATL), Austin (AUS), Baltimore (BWI), Dallas (DFW), Denver (DEN), Houston (IAH and HOU), Las Vegas (LAS), Miami (MIA), Orlando (MCO), San Antonio (SAT), San Francisco (SFO), San Jose (SJC) and Washington, D.C. (IAD and DCA). Delta Diamond Medallion members can now get free CLEAR expedited security, as the two companies have teamed up to offer the program at more Delta US hubs in the future. Membership to the service is $179 annually, and you can add a family member for $50 and children under 18 are free. If you’d like to sign up for a CLEAR membership, use the promo code CLEARTPG18 or use this link to get a discounted membership of $149 for the first year. Wear shoes you can remove quickly. Use common sense when you’re picking out your airport attire. Wear a jacket with big pockets so that after passing through security you can quickly throw your phone, wallet and passport in a pocket before grabbing the rest of your belongings. Wear shoes that you can quickly remove and then put back on. Note that you don’t have to take all of your jewelry off — many passengers leave watches on and don’t have problems when going through the metal detector. After screening, quickly grab your belongings and reassemble away from the screening area. Remember that a laptop must be removed from its case and placed in its own bin, unless you’re in a PreCheck lane. Make sure that any liquids in your carry-on bag are in a clear plastic bag (you can read the rules for the TSA’s 3-1-1 policy here). Throw away any plastic bottles with liquid in them and make sure to empty your reusable bottle before going through the security line. If there’s a bottle with liquid in your bag it’ll have to be re-screened, adding a lot of time to the process. 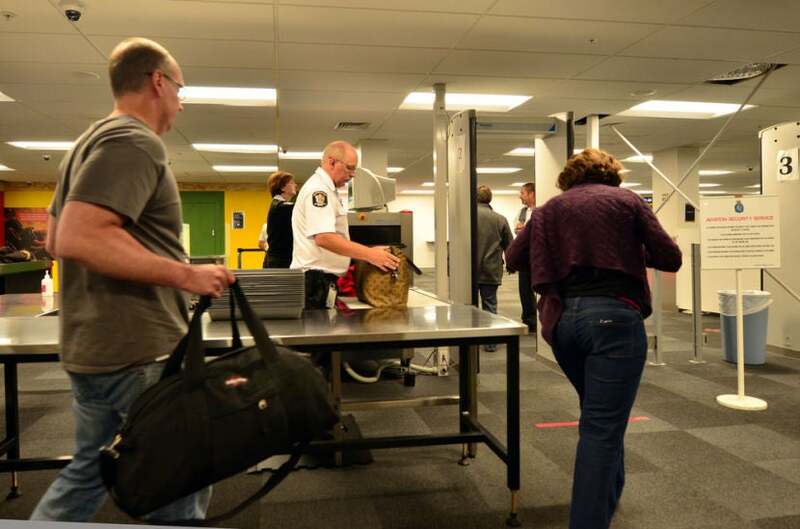 Finally, when you’re through the metal detectors, collect your belongings from the belt as quickly as possible and reassemble yourself away from the screening area. The quicker you take your belongings off the belt, the quicker everyone else can move through the line. Apps like GateGuru make it easy to track security wait times at airports. Apps such as MiFlight and GateGuru will keep you updated on real-time estimated security waiting times at the airport you’re departing from. With airport security lines achieving record wait times, it is now more important than ever to precisely time your trip to the airport. Apps like these allow you to keep an eye on the status of the line several hours before your scheduled departure time and make a better-informed decision on when to arrive. Many airports also have services that allow you to subscribe to updates on the length of the lines inside the terminal. If possible, check your bag at the counter to reduce security wait times. Most airlines now charge a fee to check a bag and thus more and more people have been flying with just a carry-on, slowing down the screening process. You could save yourself some time in the security line by checking a bag at the counter. If you don’t want to pay the fees to check your bag, take a look at these credit cards that offer free checked baggage. Additionally, cards such as The Platinum Card from American Express, Citi Prestige and the Ritz-Carlton Rewards Card offer annual travel credit that can be applied towards checked bag fees. Although TSA agents may not be the friendliest, it can’t hurt to be nice in return. This can actually go a lot further than you might think. 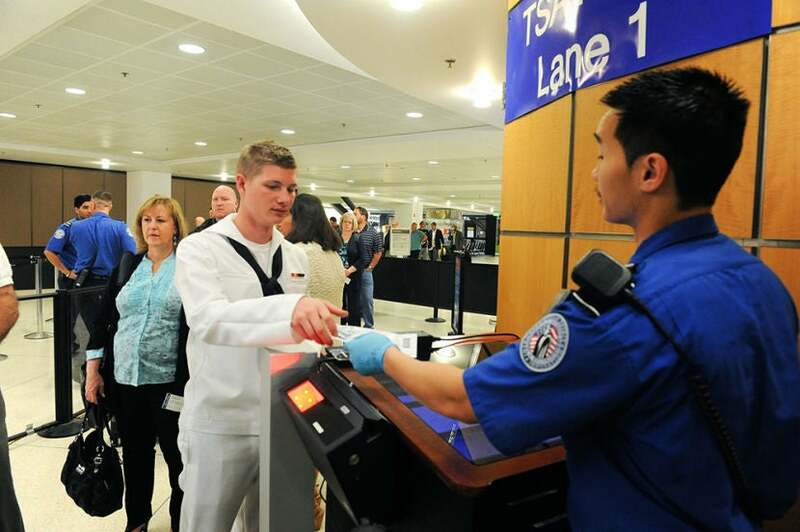 Most often, the agents manning the priority security lines are independent airport contract workers and sometimes even TSA agents. Rarely is it the actual airlines’ employees since their time can be spent better at the check-in areas or the gates. Whether it is because you are cutting your time too short and your flight is starting to board or if you are traveling with small children, they just might send you through the priority line. It can’t hurt to ask! Try not to travel at a time when the security checkpoints will look like this. Every year we hear about horror stories of airport lines around holidays, particularly the day before Thanksgiving. But with more and more travelers using the nation’s airports during peak times, you’ll want to pick your flight times wisely. Avoid choosing flights that depart at peak travel times such as Friday afternoons between 4 and 8pm, as business travelers are heading home from their work weeks and leisure travelers are heading out for weekend trips. Although going to the airport right now may seem like all gloom and doom, there are several options to get through security faster than your traveling peers. 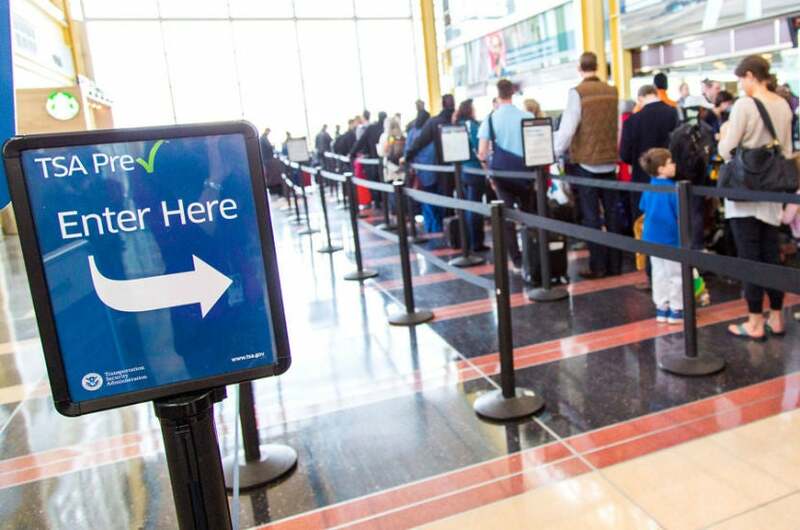 Signing up for TSA PreCheck is your first step to expedited security, but there are also other ways you can go about getting through the detectors quicker than normal, including just being in the know on what you can and cannot do.